Responsive web designs for small business are now the industry standard because they adapt to each user device. Small businesses benefit because this eliminates the need for two separate sites; a stand-alone mobile website and a stand-alone desktop website, each requiring their own updates. Many responsive website designs utilize the widely accepted WordPress content management system (CMS). CMS allows for ease in updates by companies who want to update their site in-house but do not have staff who are trained in web development or coding. Responsive websites are the latest and greatest way to present your company web content professionally to people, even when they view it on various devices. A responsive website will format to fit on a desktop computer monitor, laptop screen, tablet, or smart phone. Responsive website designs for small business are becoming the industry standard because they adapt to the users devices. Connection Group provides responsive web design throughout the United states and for many of our local customers. 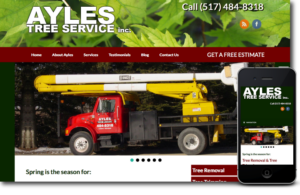 Our mobile friendly, responsive website design in Grand Rapids and responsive website design in Lansing, Michigan area help many of our small business clients reach their target audiences and keep current with search engine updates for a low cost. Call us today or complete an estimate form and we will get back to you as soon as possible. View some of our samples of responsive web design for Manufacturers in Michigan, Professional Speaker mobile friendly website designs and responsive website designs for Lansing Michigan construction companies, e-commerce responsive websites and mobile compatible websites for wholesale and retail companies plus mobile friendly websites for restaurants and pubs in Michigan. Be sure to look at the responsive web design on your desktop monitor then click on the lower right corner and drag the window to the size of a smart phone. You will see how the website responds to the various screen sizes. Test them on your smart phone too!